If you’re looking for a challenge this New Year, we might have one that is right up your street! If you live in Devon, Cornwall, or Somerset, or can commit to travelling between the counties, we are looking for an Events Assistant to work from January to May, and October to December – could that be you? The role will involved travelling to wedding fayres and events throughout the South West, helping to raise awareness of The Wedding Wishing Well Foundation, and we are looking for someone with confidence, compassion, and patience; a good communicator with a smartly turned out appearance, and a passion for speaking up about the causes you care about. The rate of pay is to be discussed. The role of Events Assistant is required for Sundays, as well as the occasional Saturday, from 11am until 4pm – please be mindful that each stand also requires setting up, and packing away, which will also be expected from you. To apply please email your CV and a covering letter to info@weddingwishingwell.org.uk. The closing date is 25th January 2015, and we shall contact successful applicants for interview in due course. We would like to tell you about a new fundraising initiative that The Wedding Wishing Well Foundation has signed up to this year – Indiegogo. A little like Kickstarter and Crowdfunder, Indiegogo allows its users to create campaigns – if you have a dream, Indiegogo wants to share it – and gain support from the Internet community, receiving funding from around the world. Simply tell the world what your dream is, and Indiegogo will help you to achieve it. We are hoping to reach a few of our goals this year too, and have turned to Indiegogo to help. Naomi tells us more: “Our registered charity is so unique that there are no avenues for us to apply for grants. All funds are raised by people like you – sponsored runs, walks, swims, or even things like this! We currently have to turn down 80% of applications due to lack of funds and high volume of people needing our help, and it breaks our hearts. We will offer you some great incentives in return for your donation; I’ve recently written a book “No Ordinary Wedding Planner”, and If you donate £20 I’ll send you a signed copy! For £50 we will send you your own Wedding Wishing Well t-shirt or hoodie, so that you can support our cause with pride. As always, there are other ways that you can help The Wedding Wishing Well Foundation if you are unable to make a monetary contribution. If you work in the wedding industry and have a service that you’d be able to offer please get in touch – we’d love to hear from you. Alternatively, if you are unable to make a larger donation, but would be able to commit to a regular direct debit of just £2, your help is equally appreciated. If you would like to help, please visit Indiegogo’s website for more information, and to give a terminally ill bride or groom the wedding day of their dreams. Naomi and her husband, Graham, recently took to the airwaves to discuss the charity’s year ahead, the upcoming Bristol and Somerset Wedding Awards, the board of trustees, and The Wedding Wishing Well Foundation’s Christmas Party, with Tone FM’s host Darren Daly. We’d also like to take a moment to point you in the direction of Naomi’s latest interview with BB Radio Devon, in which she discusses recent news reports regarding cancer drug cuts. Our latest groom Paul, who sadly lost his wife Abbey shortly after their wedding, also contributes to this emotional debate. With Christmas out of the way it’s time to start thinking about the romantic of all days – Valentine’s Day. As you may expect, we love the romance that Valentine’s Day brings, and adore feeling inspired by couples sharing they feelings and dedication towards each other. If you’re still searching for the perfect gift for that special someone in your life, take a look at Tasmia Trinkets and Charms, a company that delights in providing bespoke jewellery, and accessories, featuring your own unique designs, handprints, fingerprints, and even paw prints. What’s more, if you order your gift from Tasmia Trinkets and Charms using the code WISHING14 you’ll receive a 10% discount, while a further 10% will be donated to The Wedding Wishing Well Foundation. What could be more romantic than knowing your special present will help an amazing bride and groom to tie the knot? Let’s start the New Year as we mean to go on… with a little fundraising! Firstly, we’d like to say a huge THANK YOU to everybody who was involved with The Bristol Pavilion Wedding Showcase. They raised a brilliant £74.68 for us; a fantastic achievement. We’d also like to thank Tesco for their donation of £1,000 to The Wedding Wishing Well Foundation. This donation comes as part of Naomi’s nomination for Tesco’s Mum of the Year. While Naomi, sadly, didn’t win this year, to be nominated, and to reach the shortlist, is an amazing achievement – we are all so very proud of her, and know that the recognition really toucher her heart. Keep your fundraising news and ideas rolling in – let’s make 2015 the best year yet! January; a month to make resolutions, try something new, and feel great about the year ahead. If you’ve recently resolved to get a little healthier, or have promised yourself that you’ll do a little more for charity, we’d like to point you in the direction of some upcoming events, all of which can be run in aid of The Wedding Wishing Well Foundation. From 5km Fun Runs, to 100km challenges, there is something for everyone – what better way to inspire you to get a little healthier? Many of us find training much easier if we have a little something to work towards, so please consider taking up the challenge for us. Once you’ve registered for your chosen event please contact us on info@weddingwishingwell.org.uk, and we will gladly help you to set up a fundraising page and tell people about your training adventure. Don’t fancy running? There are numerous fundraising events planned for this year, so take a look and be inspired. Do you, or your partner, live in Hertfordshire? Are you currently planning your dream wedding? If you can answer, “yes” to both of these questions you should be visiting The Forum, in Stevenage, on the 21st February for the launch of the Win Your Hertfordshire Wedding competition. Worth in excess of £10,000, the package includes everything from a wedding dress, bridal hair and make up, stationery, catering, and photography, to wedding flowers and centrepieces, chair covers, a photo Booth, sweet Buffet, wedding Cake, wedding Car, room decor, a live singer and disco, burrito buffet and, of course, The Forum venue; this is a fantastic opportunity to experience the wedding of your dreams, absolutely FREE. A complete list of suppliers can be found here, although we strongly suggest heading to The Forum in February to see for yourself; it’s bound to be a great evening. You are cordially invited to attend both the wedding fair, which takes place between 11am-3pm, and the launch night itself, from 6pm. The latter includes an auction and raffle, with some amazing prizes. All proceeds raised will be donated to The Wedding Wishing Well Foundation. 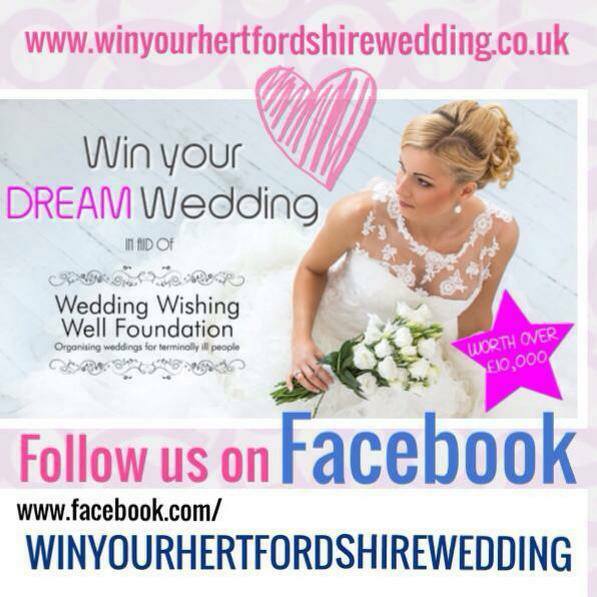 Visit http://www.winyourhertfordshirewedding.co.uk, or the event’s Facebook page, to find out more, and to register your interest in the event.